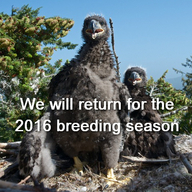 The new Humboldt Bay Eagle Cam systems were purchased through generous donations from our viewers. We thank the private landowners for their willingness and support in sharing this nest with the world. Camera installation, maintenance, and streaming is provided by the Institute for Wildlife Studies and Jim Campbell-Spickler of Eco-Ascension Research and Consulting. We also thank the Sequoia Park Zoo for the 2012 grant awarded to the Humboldt Wildlife Care Center Humboldt Wildlife Care Center, that helped bring you the 2013 nesting season. Watch both camera views at www.iws.org/hbe.html and see reports of nesting activities at the HBE Forum.